The Milwaukee Brewers opened a 10-game home stand with a 7-5 win over the St. Louis Cardinals at Miller Park on Thursday night. Travis Shaw, Eric Thames and Jett Bandy clubbed home runs to push the Brewers league leading total to 32 for the season. The Brewers have hit at least one home run in 12 straight games. The Milwaukee Brewers are relegated to playing spoilers in the final month of the baseball season. They’ve been playing the role well the last few days. After a pair of wins to end their series with the Cubs at Miller Park, the Brewers marched into St. Louis and banged out 17 hits in a 12-5 win over the Cardinals at Busch Stadium. Cardinals lefty Jaime Garcia entered last night’s game with a 2-1 record and 1.23 ERA against the Brewers this season. He was 11-5 with a 2.61 ERA in 20 career outings. Randal Grichuk’s RBI single in the 10th inning gave the St. Louis Cardinals a 2-1 victory over the Milwaukee Brewers on Tuesday night at Miller Park. It’s the sixth straight loss for the Brewers, which tied a season high. The loss goes to reliever Corey Knebel, who failed to do his job for the second straight night. Knebel fell to 0-2 on the season. The Brewers wasted an outstanding performance from starter Wily Peralta, who allowed one run on three hits while striking out ten in seven innings of work. His ERA dropped from 6.68 to 5.53. Whatever it is that makes the St. Louis Cardinals so comfortable inside Miller Park, it continued on Tuesday night. 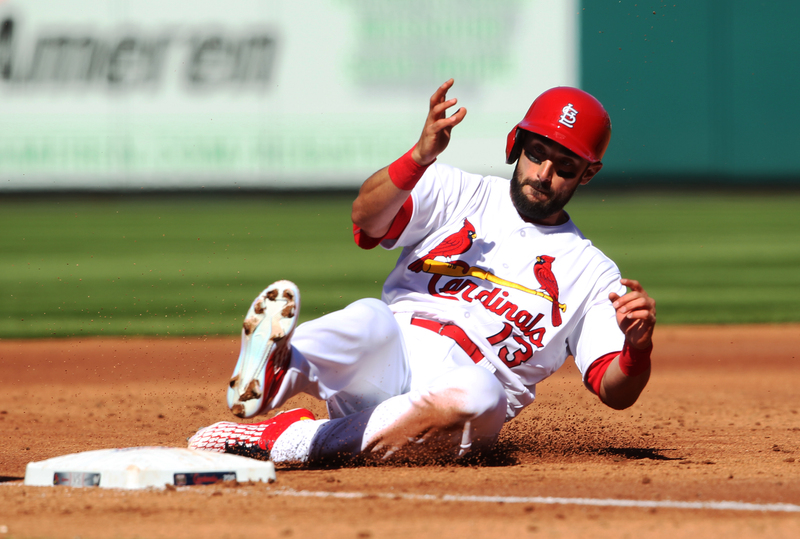 The Cardinals broke open a 3-2 lead in the 7th and pulled out a 10-3 victory. Since Miller Park opened its doors, the Cardinals have posted a 77-47 record against the Brewers, including 30 wins in the last 40 games. The Cardinals worked Wily Peralta’s pitch count to 97 through five innings, sending him to the showers early. Peralta has now failed to pitch at least six innings in nine of his 11 starts. He fell to 3-6 with a 6.51 ERA. Jaime Garcia tossed a one-hitter as the St. Louis Cardinals cruised past the Milwaukee Brewers 7-0 at Busch Stadium in St. Louis on Thursday afternoon. Domingo Santana singled in the sixth inning for the Brewers only hit off of Garcia, who struck out 13 Brewer batters. It’s the most strikeouts for a Cardinals left-handed pitcher since 1970. 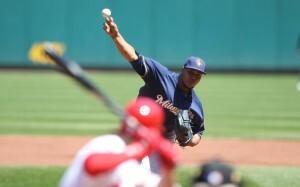 Milwaukee’s opening day starter Wily Peralta fell to 0-3, giving up five runs in five innings on seven hits with two walks. The right-hander’s ERA is now 10.13, as he has given up 15 runs in 13 1/3 innings. Jeremy Hazelbaker and Randal Grichuk homered for the Cardinals, who took two of three in the series. The Brewers will open a three-game weekend series against the Pittsburgh Pirates at PNC Park in Pittsburgh tonight. Domingo Santana delivered a two-run home run to center field off of closer Trevor Rosenthal, leading the Milwaukee Brewers to a 6-4 win over the St. Louis Cardinals at Busch Stadium on Wednesday night. The 440-foot, 2-out blast to center came off of a 98 mph fastball and was Santana’s first home run of the season. Jonathan Lucroy had a three-hit night and drove in two runs to help the cause. The Cardinals had just tied the game in the 8th inning when pinch-hitter Brandon Moss clubbed a home run off of Brewers reliever Michael Blazek. That took a win away from Brewers starter Chase Anderson, who allowed three un-earned runs in the first inning and departed after six innings with a 1-run lead. Anderson didn’t get the win, but he hasn’t allowed an earned run over his first 11 innings of the season. Santana’s home run gave Blazek the win in relief. 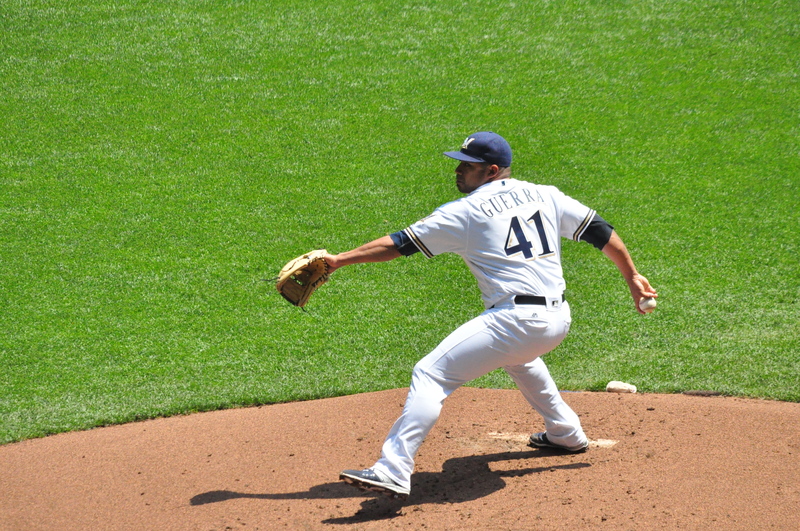 Jeremy Jeffress worked the ninth inning and earned his 4th save in as many tries. The Brewers evened the series at a game apiece. The series finale will be played this afternoon at Busch Stadium.